This month, we’re shining our igoo monthly spotlight on cocktail emporium, Santa Chupitos. Having cemented themselves as a must-visit bar in Liverpool city centre, Santa Chupitos and their mouthwatering array of drinks continue to go from strength to strength. Their one page website, which was launched in 2012, turns your average night out into a much more exciting experience. The website creates a collage of photos direct from their Instagram feed, meaning snaps of your favourite cocktails and wild nights out are displayed right here, amidst all of the action. With full drinks menus online, you can begin the difficult decision of which cocktails to choose for the night ahead, along with finding full information regarding hiring the venue and its bartenders for special occasions. 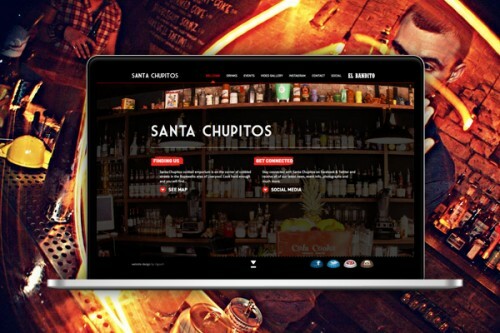 The website also links to an brochure site for their sister tequila bar, El Bandito, which is located below Santa Chupitos.